The 33-year-old is on the verge of a comeback after being named as a replacement for Sunday's Championship opener against Bedford Blues. Now the Welshman is fit he is desperate to help Bristol achieve promotion. "It was so painful, I honestly thought it was the end," Henson told BBC Radio Bristol. "The work the surgeon has done is unbelievable." 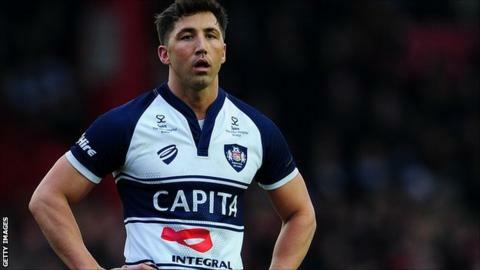 Henson was injured in the first-leg of Bristol's play-off with Worcester with his side eventually missing out on promotion with the last kick of the second leg. The utility back admitted the defeat was hard to take but the squad have now moved on. "I was devastated," he said. "Personally with the injury but more so missing the final game. It was a horrific seven days for me, so unfair. "I watched it, I wish I hadn't. I didn't sleep. "We've got to move on, it's all about this season now. We are going to do it now, no problem." With Henson close to a competitive comeback he said helping Bristol win promotion and earning himself a new contract were his two main aims for the next 12 months. "Our squad is so exciting, I can't wait to get in the mixer," he said. "We have made some great signings and are looking to win this league comfortably. "I'm running out of time, I'm 33 and I'd like a couple of years in the Premiership. My contract is up at the end of the season so I'm playing for a new one. I'm going to try and show the coaches I can be better than last year." On the possibility of extending his contract he added: "There isn't anywhere else I'd rather be. It's an awesome journey we're on with the stadium, we are going to get into the Premiership and I'd love to be a part of it. "It's a great environment with the coaches, physios and players. It meets every one of my needs."